Today’s project is SO. MUCH. FUN! 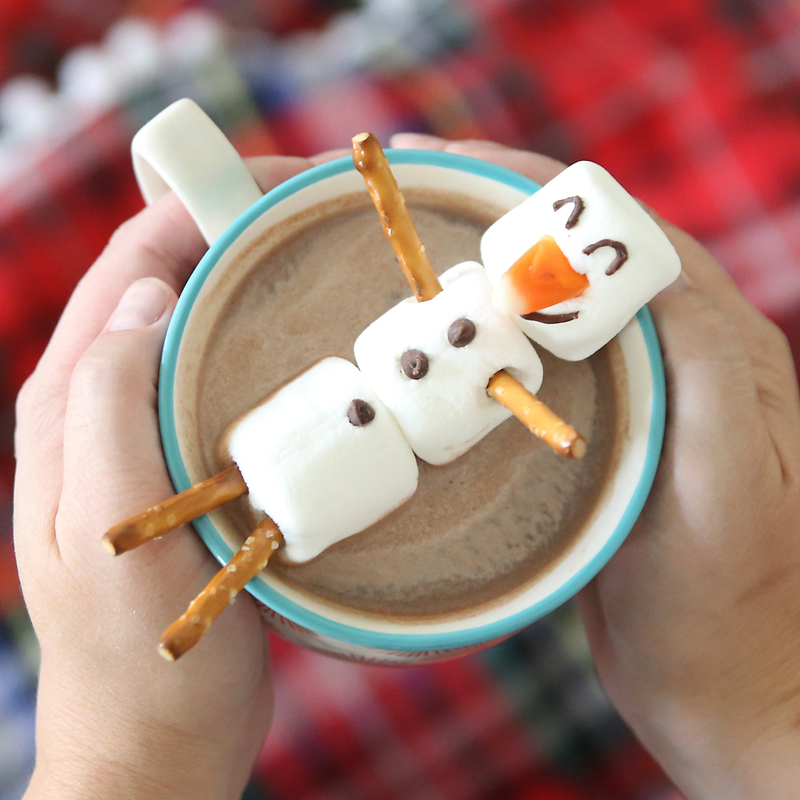 These easy-to-make marshmallow snowmen float in a mug of hot cocoa for an adorable and tasty winter treat. They’re adorable AND simple enough for kids to make. My daughter ended up making an army of snowmen because she thought they were so cool. I got this idea from a photo I saw on Pinterest last year of an adorable marshmallow snowman hanging out in a cup of cocoa. He was so cute that I spent quite a while clicking around to find instructions for how to make him. After lots of dead-ends, I finally traced the photo to it’s source and it turned out to be a stock photo, not a tutorial, so there were no instructions. So I figured out how to make a marshmallow snowman of my own – it’s not hard – and I’m sharing the easy instructions with you today! Here’s a video that shows how to make them. The pretzel sticks are a little too long for the proportion of the snowman, so I bit off the ends, leaving them about 3/4 as long as they were to begin with. Just experiment and see what look you like. Also, I find that they go in a little easier if you twist them as you’re pushing them into the marshmallow. Normal sized toothpicks won’t work; you need the 4 inch variety, which is pretty easy to find at most grocery stores. Slide three marshmallows on the toothpick to create a snowman, then use scissors to clip off the pointy end of the toothpick. Use the toothpick to poke holes for the arms, legs, and nose, and then push pretzels and a candy corn in the snowman. Then poke small holes for the buttons and push mini chocolate chips into the holes. Place some mini chocolate chips in a sandwich baggie and melt in your microwave (30 seconds at a time until melted). Snip off a tiny corner of the baggie and “pipe” the chocolate out to draw eyes and a mouth on the snowman. Make sure to let small kids know that there is a toothpick inside the snowman before they start eating it. That’s it! 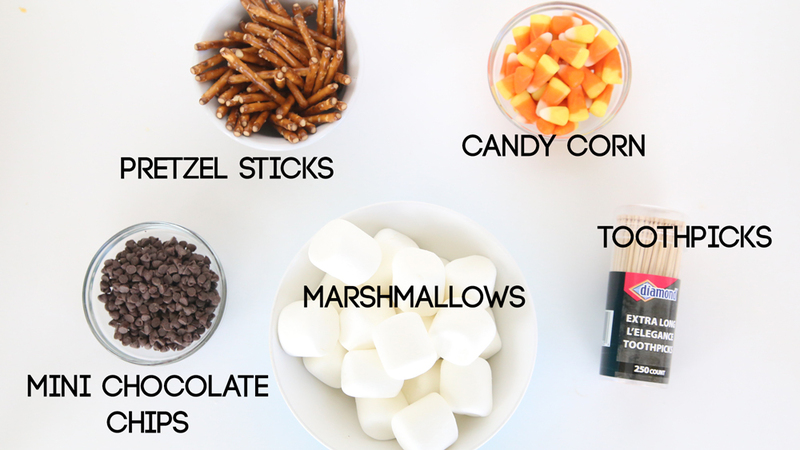 Have fun making marshmallow snowmen for your cocoa! So cute, Autumn! I will most definitely make this with the three year old baby brother- he will be very excited about it!! So damn adorable! Love it. Aww, it looks too cute to eat. I think I would use pretzel stick to hold the marshmallows together. Then you don’t have to worry about the tooth pick.